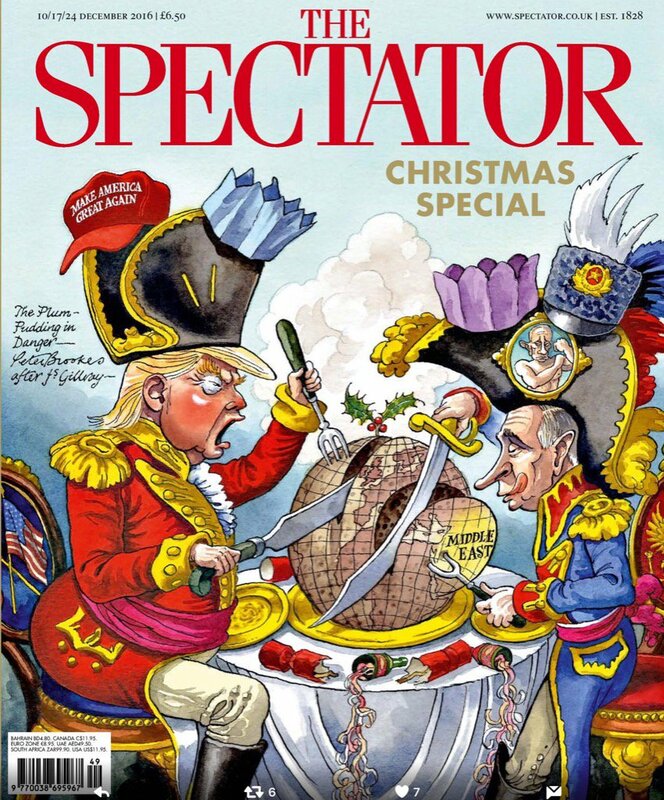 The Spectator Christmas special cover is re-presenting one of James Gillray’s most famous satires dealing with the Napoleonic wars. In the original, Prime Minister William Pitt sits on the left of the picture opposite Napoleon Bonaparte, both of who are slicing up the globe in a bid to gain a larger portion. The intention of the piece is simple, it is showing the avaricious pursuit of international dominance by both the French and British governments. The spectator have just replaced Pitt with Trump and Boneparte with Putin to show the political ambitions of the two current most powerful men in the world. This entry was posted in Referential Cartoons and tagged Peter Brookes, political cartoons, The Spectator on December 8, 2016 by Chris Walker.